A chatbot, or chatterbot, is a computer program aiming at simulating a written conversation with a human user. Well, first… because it’s fun! Since Alan Turing, chatbot programming has been a way to test computer’s ability to pretend like they are human (see Turing test). Also, chatbots can be have very useful applications, such as helping users on a website, teaching a language, etc. The question this program will answer is: given a user input sentence, which output should we produce? For this simple example, we are not going to try to extract the meaning of the sentences written by the user. That would be a lot of work, and it is not needed for what we want to achieve. 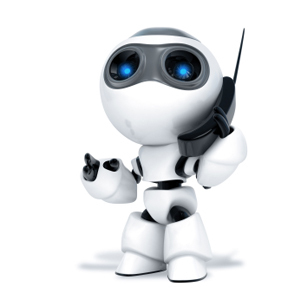 Learning – when the user types a message, it is understood as an answer to previous statement made by the chatbot. The sentence typed by the human will then be associated with the words present in the previous message. Answering – the human message is decomposed in words. The program will try to identify which sentences correspond best to those words, according to its previous “experience”. """Retrieve an entity's unique ID from the database, given its associated text. If the row is not already present, it is inserted. The entity can either be a sentence or a word.""" """Retrieve the words present in a given string of text. and the second member the number of time it is present in the text.""" H: Very well, thank you. B: Very well, thank you. H: Do you like music? B: Do you like music? H: In a very good mood. H: What is the weather like? B: What is the weather like? H: I have to go. Goodbye! H: In a good mood. B: I have to go. Goodbye! H: Very well, thank you. How are you? B: In a very good mood. H: Glad to hear that. H: Hi! How are you? B: In a good mood. H: Great! How do like chocolate? H: Really? Me too! What is the weather like at your place? does all chatbots based on quite simple pattern matching? Hi Mathieu, thank you very much for sharing your code, the idea behind it is very nice and simple! Sorry but I’m a bit new to databases in general, I’m sure the solution is simple but I can’t find it. Would you help? Oops, my mistake… it should have been text instead of value. Corrected it in the above code, thanks! Works perfectly now, thank you! Hi, I would recommend using SQLAlchemy to manage a connection pool (see http://stackoverflow.com/a/22739924/734335). Some day, I would need to rewrite the above code with a proper ORM… I didn’t use any in the above example because the contest I originally wrote it for (http://codegolf.stackexchange.com/a/24711/18794) didn’t allow external libraries. Just create a Python script with the code above. Name it (let’s be creative) chatbot.py. You can now execute it just by running python chatbot.py (there is no dependency to install, as SQLite is included in modern versions of Python). The SQLite database will automatically be populated if the tables are not already present. I tried your program in french language. So, I modified it because french caracters like “ç” for example crash the bot. Moreother, using espeak, I make it speack in french. Good job, that’s really fun. I wanted to create me too a chatbot using a SQL database but my knowledge in SQL interfaces is limited. Hello, I don’t know how to word this, because I am new to programming, but I will try my best. I have used your code and it works fantastically, however, I want to improve upon it, but I do not know how too. My question is, how would you alter the code, to run this to be similar to a chat messenger app? By this I mean, that you have a pop up box where you type your answer, as the chatbot supplies its answer in the line below. Is it possible to not have the code visible at all, as a different window pops up as you chat? Well, to do that you’d probably need something more than just python, maybe connecting it to HTML and CSS in a simple webpage. Here is how to use python on the web https://docs.python.org/2/howto/webservers.html. You can make a simple webpage without a server, just for you to see it, with a text editor, ask for more if you are interested. I am new too, so I might be wrong, but using HTML and CSS looks like the only logical way to do what you are asking for. I used this code to make a bot for http://www.chatango.com(it’s a website that hosts chatrooms). I wanted the bot to be able to talk, not just execute commands with ch.py, so I used your code (which I hope is okay with you). The bot connects to the chatroom, and to respond, it waits for a message that will start with it’s name, then answers. I thought it would work fine, but the problem is, that when I talk to the bot, it doesn’t seem to actually understand what I am saying and store my input and answer in the same way later etc. It just picks a random answer, from the input it has already stored. (If you talk to it, it stores your input, but it always answers randomly). Since the user has to be the first to say something, in my program, the bot does not talk first, it waits for you to say anything, then prints what var B is set in the beginning of the program (“Hello!” for example) and then goes on with H.strip() and the rest of the code. Could that be my error? Can anyone here help me? Sorry for the long question. Hey, great tutorial. Can you please help me make the change from sqllite3 to mysql, as i am going to be using this on a raspberry pi. I would like it to be in mysql so then i can just copy the sql code to a new server on a new raspberry pi. Once, i have got the mysql working i am going to add eSpeak so then the bot can speak its responses. Okay, my bad I found out that it was the second line stating words_length = sum([n * len(word) for word, n in words]) that was giving the error and it was because I had left out the n on n in words. Hello Mathieu Rodic gtreat job with this tutorial! Ypu said “this is a very simple one. Some try to use syntax analysis,” on another question and i want to know if you have or known a tutorial who cover that part? i’m very interested on it. Hello, I think your code is very good. If I understood correctly, in this code the bot learn from what humans say, am I right? I mean that the bot will grow its database every time when someone speaks with it and then when it is spoken to, it will search the matching phrase. Isn’t this how the machine learning work? What are the things that doesn’t qualify this as machine learning bot? …but what people call machine learning nowadays either involves neural networks, or genetic algorithm. In that sense, this program doesn’t really qualify. Thank you Mathieu, it is very funny and usefull. I think with little patience I will have a very smart chatbot. Hi Mathieu! That’s a cool bot! i learn it but i still consufed with the code. i’ll try to understand your code, hmm can i using postgreSQL with this code? should i modify the code to make the AI more understand with my question? Btw, Thanks! it really help me! Hello! You can use PostgreSQL instead of SQLite for database. You should seek another kind of bot if you have more specific application in mind. Do you have any suggestion to build such a bot? Or parse the sentence in order to retrieve its structure (see CONLL-X format), but that’s much more complicated if you just want to build a simple application. But first you would need to treat the input as a list of words (e.g. with re.findall(r'\w+', input_text)), to facilitate further treatment. NameError: name ‘raw_input’ is not defined. Which version of Python are you using? 2 or 3? Thanks a lot! I have been looking for something like this to play around with for quite some time now, so I’m glad I found this! Hello rodic, your program is really nice :). I just want to know the chatbot can print hour and date. but this doesn’t work in the program can you yelp me thank you 🙂 and other time very nice work. Hello, this formula takes the number of times a word is present in what the user wrote, and counterbalances that number by the total number of words to give a score for that word. Thanks a lot for this very good basis ! – replacing the ‘print’ and ‘input’ functions by a ‘sey’ and ‘get_response’ methods that can be anything more than just the console. Now I am looking for another method to make it learn previous conversations to accelerate the process. Any idea ? Other methods would be more complex, and might involve either machine learning (Theano with RNN could be an option), syntax analysis (see CONLL-X), or both. I am very curious about the encapsulation, did you provide a public a example? iI would like to take your code and have it call my wiki app, how would I do that? Any suggestion how to get around it? Hello, I corrected my code, in particular the part about creating the tables. Does it work for you now?